When it comes to managing society’s resources, the construction sector is one of the most important segments of the economy. Construction is responsible for 40% of society’s total energy consumption, 35% of its use of raw materials and produces 30% of all waste. If our aim is to have a carbon neutral society within the near future, the construction industry will need to play a vital role in our attempt to achieve this goal. Of all the CO2 emissions generated during the entire lifespan of a new building, 40% is attributed to the embodied carbon within its construction materials. By making changes to the material choices in the construction process, there is therefore an enormous potential to positively contribute to carbon emission reductions. To achieve a CO2 neutral society of the future, we believe that as architects & engineers, it is vital that we are always looking to bring new techniques and technologies to how we construct climate friendly housing. 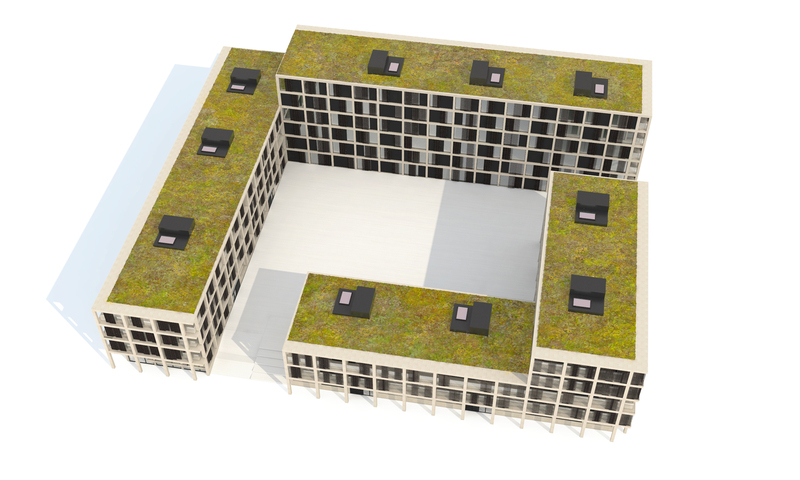 Therefore, we have designed an experimental residential building based upon a typical housing block – a building typology which is currently being constructed in large quantities across all Danish cities. 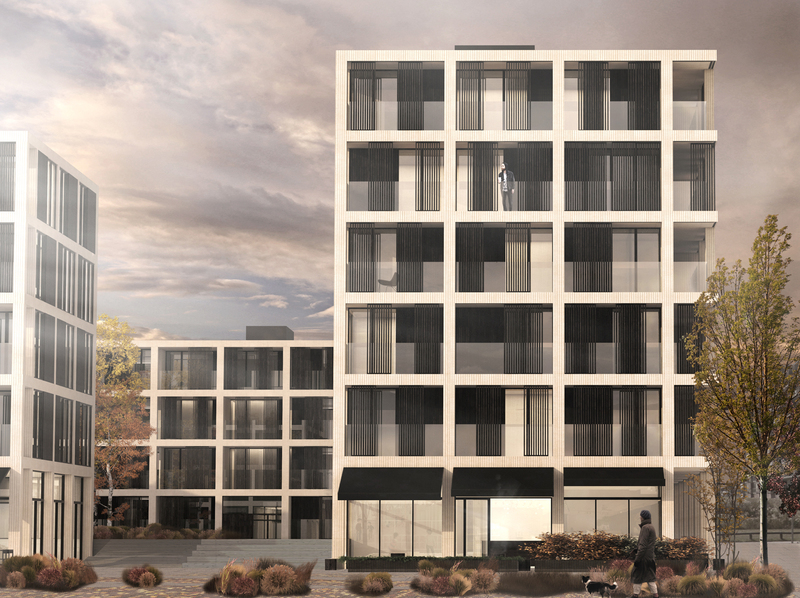 This experimental project – which provides 10,000 m2 of residential housing – takes its starting point by replacing the traditionally carbon intensive construction material concrete with Cross Laminated Timber (CLT) elements. By replacing the concrete structure with CLT, the building achieves an embodied CO2 reduction of around 66%. Meaning that for the carbon embodied in 1 concrete framed building constructed, 3 CLT framed buildings could be constructed. Timber is one of the few truly renewable building materials and it is therefore evidently an important solution in accommodating the challenges presented by energy consumption and waste management. Cross Laminated Timber is renewable, easy to manufacture and transport, with a very low CO2 footprint. All these positive characteristics make timber an obvious choice for construction, especially when considering the enormous quantity of residential buildings currently constructed in Denmark. Over the next decade the entire building industry faces a revolution due to increasing capabilities of CNC cutting, robotic technology and digital 3D production. This will further expand the range of new possibilities for timber construction as the preferable building material for the future’s mass-produced residential buildings. Rapid construction times. Unlike when building with concrete, there is no need to allow the construction elements to dry before beginning the next level of the building. There is also no need to dry out the final shell of the structure before beginning on the internal fittings. Therefore, the entire construction process can be drastically streamlined and becomes much more efficient. A reduction in the need for transportation of construction materials, and the associated carbon emissions; a lorry can deliver up to 10 CLT elements in one load, as opposed to typically only two concrete elements. A cleaner and more efficient construction site – fixtures and fittings can be embedded without the need for noisy and dust producing concrete drilling. Direct assembly of components can take place quickly with screw fixtures which furthermore enables design for disassembly. This also shortens construction time and thus energy consumption on the construction site. Greater precision: offsite manufacturing of CLT components can ensure that tolerances are in millimetres rather than centimetres, and working seamlessly with accurate steel details, such as elevator fittings. Simple construction techniques and tools – In principle the structure is constructed from CLT elements, angle brackets and screws. CLT elements are very sustainable as a renewable resource. It can be easily disassembled and recycled at the end of the building’s lifespan. Timber has great hygroscopic functionality, ensuring a positive impact on air quality. Allows for a greater flexibility in space adaptability, apartments can be joined together, or extended easily and economically.